Fourteen of SETsquared’s most exciting start up technology companies took part in this year’s Global Corporate Venturing (GVC) Symposium (24-25 May 2016). The SETsquared enterprises pitched their work to more than 400 corporate venturing business leaders and investors at the prestigious event in London at the end of May. AccurIC has developed a technology in LED lighting offering better quality, greater efficiency and longer life. ContinuumBridge has developed a technology platform for managing, monitoring and controlling remote devices, enabling businesses and organisations to create new revenue streams, streamline processes and personalise service delivery. Custodian Solutions works internationally with large enterprises, intelligence and technology specialists to protect brands from counterfeiting. Dashboard has created a solution for the oil and gas industry that uses continuous real-time monitoring and harnesses innovations in electronics manufacturing, communications and enterprise cloud technologies. Dyanamon has developed an analytical software service that saves money for the road transport and logistics industry through predicting fuel savings and ROI. 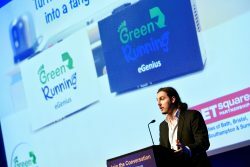 Green Running provides a range of products to help monitor, analyse and manage energy consumption. iGeolise makes maps and data searchable by travel time, rather than distance. Living Map is a next-generation bespoke mapping platform that helps cities and venues monetise their data. NquiringMinds develops data analytics and secure IoT solutions for smart cities and industrial IoT markets, specialising in security. SPIn is developing a Multipurpose Adapter Generic Interface Connector which will support the space industry to increase profits during satellite manufacturing as well as help it to meet satellite over-demand. TomogTech has developed a rapid and automatic pipeline scanning solution for the oil and energy industry, that uses a tomographic imaging method to non-invasively visualise the thickness of pipe walls. Trimunocor has developed a protein that can be artificially produced cheaply and in large amounts that is essential in preventing inflammation in the lung. Utonomy has developed an innovative technology to create autonomous networks that address the problem of shrinkage in gas distribution networks. XIM has created its patented Lifelight technology that can predict a heart attack up to 24 hours before it occurs, without the need for wearable devices or expensive specialist equipment.